The Clevedon Restaurant & Bistro01943 968398work RestaurantThe Clevedon Restaurant and Bistro is rapidly gaining a reputation for excellent home-cooked dishes, served by friendly and attentive staff, overlooking some of the best views of the Wharfe Valley from anywhere in Ilkley. The two-courses for £10.95 lunchtime menu is a real winner, as are the traditional Sunday lunches and Carvery. The sun-filled terrace provides the perfect setting to enjoy a relaxing afternoon tea, and our full calendar of events is bound to provide interest to many. The Clevedon Restaurant and Bistro is rapidly gaining a reputation for excellent home-cooked dishes, served by friendly and attentive staff, overlooking some of the best views of the Wharfe Valley from anywhere in Ilkley. 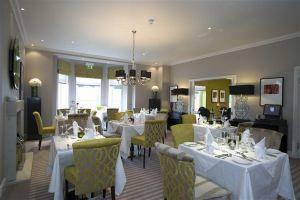 The two-courses for £10.95 lunchtime menu is a real winner, as are the traditional Sunday lunches and Carvery. The Clevedon is located at the top of Ben Rhdding Drive, close to the village of Ben Rhydding on the outskirts of Ilkley.